Zeal & Ardor released one of the top albums of the year recently with Devil Is Fine, (http://roomthirteen.com/cd_reviews/13925/Zeal__Ardor__Devil_Is_Fine.html) justifiably lighting a match underneath the idea that all bases have already been covered in heavy music. The unique blend of post-Black Metal, Chaingang vocals, soul and a touch here and there of electronic has made Manuel Gagneux's project one of the most exciting to emerge in music this decade. 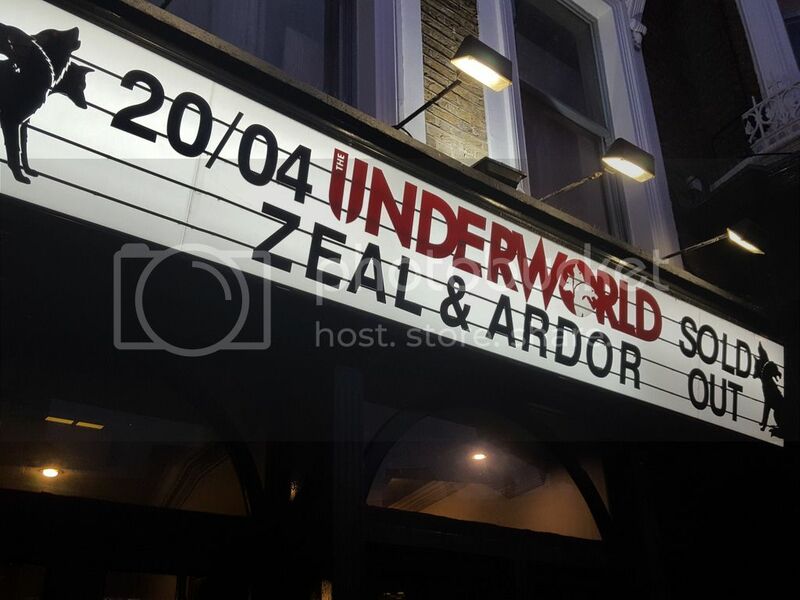 It is impressive to say the least that despite only having this record behind them and no prior word-of-mouth as far as live shows are concerned (this was actually only their third gig ever as a band) they still managed to sell out The Underworld with apparent ease. Right from the off they had the entire place in the palm of their hand. Coming out to complete darkness, only the odd flash from a camera allowed you to see them on stage for the first minute or so. Much like the record, the key for their live shows will be to present an intoxicating aura and needless to say they've already got that down - as far as the actual tracks are concerned they were elevated even beyond what you hear on the album. The two backing vocalists worked brilliantly in tandem with Gagneux and hearing the songs with a live drummer pummelling your senses just made all the difference. Considering this is a record which many wouldn't have really heard until the month prior to the show (these tracks were also floating about last year) the fact that the majority of the crowd were chanting along as loud as they were is testament to the kind of impact Zeal & Ardor are having at the moment. Some of the more unfamiliar, newer, material they threw out there also sounded absolutely gigantic - an indication that whilst people speculate where Zeal & Ardor are headed next, they've already stepped up. Closing out with crowd favourite Devil Is Fine the band themselves looked overwhelmed by the level of reaction they were getting. The show came to an end and there was a two minute round of applause in sheer acknowledgement for what this band are producing at the moment. Not only have they delivered one of the best albums of 2017 but they've now got an incredibly intense live show to go with it. Gagneux's very raw display of appreciation back to his audience at the end felt almost like a break of character away from his dark and powerful stage presence but it was genuinely great to see.